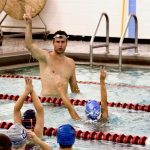 Within 250 miles of Pittsburgh, PA.
Get ahead of the competition at this high performance swim clinic focusing on techniques to help you blast of the blocks, power through the underwater dolphin kicking, and explode into your breakout! The best swimmers in the world are inquisitive and they constantly focus on improving their form. Find the right technique for YOU to maximize your performance with Olympic Gold Medalist Nick Thoman! Scroll down for details on the curriculum. Space is limited! The fastest that you're EVER MOVING in a race is on the start. Maximize that speed, power, and momentum by learning how to get off the blocks even faster, power through the underwater dolphin kicking, and then carry that speed into your stroke by exploding into a fast and efficient breakout. Nick Thoman is one of our best teachers. He will help you DROP TIME! STARTS: Set the tone for a great race with a powerful, streamlined and fast start. There are countless intricacies to performing a great start and you only get better with practice. Learn Nick's tips to get off the block and into the water with speed and power! UNDERWATER DOLPHIN KICKING: The fastest swimmers know how to weaponize their dolphin kicking. It is absolutely, undeniably, the fastest way to move through the water! Whether you dolphin kick on your stomach, side or back, understanding the importance of streamlined, underwater speed is vital for every swimmer! Let Nick teach you how to make the most of your streamline and underwater kicking, as well as teach you drills on how to improve upon those skills. ASK QUESTIONS: Swimmers and parents are invited to ask Nick questions during a Q&A session. Gain insight into his training regimen, diet and nutrition, and recovery tactics. WATCH THE CLINICIAN: Observe Nick Thoman swim at full speed and demonstrate a progression of perfectly executed drills to achieve powerful, efficient and fast swimming. Take a photo while wearing Nick's medals, get autographs, and a gift from TYR Sport!